Close to nine in ten teens are internet users. The vast majority of teens in the United States, 87% of those aged 12 to 17, now use the internet. That amounts to about 21 million youth who use the internet, up from roughly 17 million when we surveyed this age cohort in late 2000. Not only has the wired share of the teenage population grown, but teens’ use of the internet has intensified. Teenagers now use the internet more often and in a greater variety of ways than they did in 2000. There are now approximately 11 million teens who go online daily, compared to about 7 million in 2000. 87% of U.S. teens aged 12-17 use the internet, up from 73% in 2000. By contrast, 66% of adults use the internet. 51% of teenage internet users say they go online on a daily basis, up from 42% in 2000. At the same time, the scope of teens’ online lives has also broadened. One out of every two teens who use the internet lives in a home with a broadband connection. Wired teens are more frequent users of instant messaging. And they are now more likely to play games online, make purchases, get news, and seek health information. 81% of teen internet users play games online. That represents about 17 million people and signifies a growth of 52% in the number of online gamers since 2000. 76% get news online. That represents about 16 million people and signifies growth of 38% in the number of teens getting news online since 2000. 43% have made purchases online. That represents about 9 million people and signifies a growth of 71% in teen online shoppers since 2000. 31% use the internet to get health information. That represents about 6 million people and signifies growth of 47% in the number of teens using the internet this way since 2000. Still, despite this momentum, 13% of American teenagers — or about 3 million people — still do not use the internet. About half (47%) of teens who say they do not go online have been online before but have since dropped off. Those teens who remain offline are clearly defined by lower levels of income and limited access to technology. They are also disproportionately likely to be African-American. On the opposite end of the spectrum, nearly all teens in households earning more than $75,000 per year are online, most of them with high-speed connections. Teens are technology rich and enveloped by a wired world. An overwhelming majority of all teenagers, 84%, report owning at least one personal media device: a desktop or laptop computer, a cell phone or a Personal Digital Assistant (PDA). 44% say they have two or more devices, while 12% have three and 2% report having all four of those types of devices. Only 16% of all teens report that they do not have any of these devices at all. 83% of all the teenagers we surveyed state that “most” of the people they know use the internet. 10% say that “some” of the people they know use the internet. Just 6% say that very few of the people they know use the internet. 45% of teens have cell phones and 33% are texting. Close to half of teens (45%) own a cell phone, and 33% have used a cell phone to send a text message. Texting on cell phones is particularly common among those who already go online frequently and use other internet tools often. Teens who have cell phones are heavy users of online communication tools. One in four cell phone-owning teens have used their phone to connect to the internet. Email is still a fixture in teens’ lives, but IM is preferred. For many years, email has been the most popular application on the internet—a popular and “sticky” communications feature that keeps users coming back day after day. But email may be at the beginning of a slow decline as online teens begin to express a preference for instant messaging. The presence of email in teens’ lives has persisted, and the number that uses email continues to surpass those who use IM. However, when asked about which modes of communication they use most often when communicating with friends, online teens consistently choose IM over email in a wide array of contexts. Teens who participated in focus groups for this study said that they view email as something you use to talk to “old people,” institutions, or to send complex instructions to large groups. When it comes to casual written conversation, particularly when talking with friends, online instant messaging is the clearly the mode of choice for today’s online teens. Instant messaging has become the digital communication backbone of teens’ daily lives. About half of instant-messaging teens — or roughly 32% of all teens — use IM every single day. As the platforms for instant messaging programs spread to cell phones and handheld devices, teens are starting to take textual communication with them into their busy and increasingly mobile lives. IM is a staple of teens’ daily internet diet and is used for a wide array of tasks — to make plans with friends, talk about homework assignments, joke around, check in with parents, and post “away messages” or notices about what they are doing when they are away from their computers. 75% of online teens — or about two-thirds of all teenagers — use instant messaging, compared to 42% of online adults. 48% of teens who use instant messaging say they exchange IMs at least once every day. The landline phone lives on. 51% of online teens usually choose the landline telephone when they want to talk with friends. 24% said they will most often use instant messaging. 12% prefer to call friends on their cell phone. 5% use email most often to communicate with friends. 3% prefer to use text messages. Teens share more than words over IM. IM is a multi-channel space of personal expression for teens. They typically converse in text, but they also share links, photos, music, and video over IM. 50% of IM-using teens have included a link to an interesting or funny article or website in an instant message. 45% have used IM to send photos or documents. 31% have sent music or video files via IM. IM and text messaging help teens stay in touch with their parents. Instant messaging and text messaging are not simply used for conversations with other tech-savvy peers. Almost one in three (29%) teens who use IM or text messaging will use it to communicate with their parents. Face-to-face time still beats phone and screen time for teens. Even with their great affection for the technology, teens still report, on average, spending more time physically with their friends doing social things outside of school than they report interacting with friends through technology. An average youth between ages 12-17 reports spending 10.3 hours a week with friends doing social activities outside of school and about 7.8 hours talking with friends via technology like the telephone, email, IM or text messaging. Half of families with teens have broadband. Families with teens, like much of the rest of online America, are evenly divided between households with broadband and households with dial-up. While families with teens are more likely than other Americans to use the internet, they are no more likely than other Americans to have broadband connections. 47% of families with teens who have internet connections at home report dial-up access. 51% report broadband access of some kind. Eight in ten wired teens play games online. Aside from having a much higher level of exposure to the internet than adults, teens also exhibit some distinctly different online behaviors from adults. When compared to adults, teens are more than twice as likely to play games online; 81% of online teens say they are gamers, compared to 32% of online adults who say this. Teens are also more inclined to use the internet to get information about a prospective school; 57% of online teens use the internet to search for a school they might attend, while 45% of online adults do this. 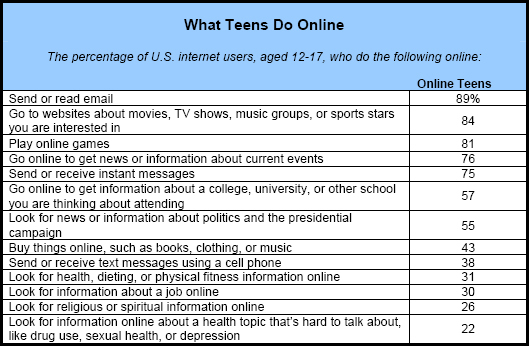 Online teens are just as likely as adult internet users to use email, get news, or seek religious information online. 67% of online adults make purchases online compared to 43% of online teens. However, it is important to note that there has been a striking increase in the number of teen shoppers compared to our 2000 survey. 44% of online adults seek job information online, compared to 30% of online teens. Most teens use shared computers at home and growing numbers log on from libraries, school, and other locations. Though teenagers are prone to log on wherever there is an internet connection—whether at home, at school or at a friend’s house—the vast majority of teens go online most frequently from home. And while one-quarter of wired teens have private access in an area like a bedroom, almost three-quarters use computers located in open family areas that are shared with others in the family. 26% of teens who go online from home do so from a private area like a bedroom. 73% of home teen users go online from a computer located in an open family area. 54% of online teens say they have gone online at the library, up from 36% who reported this in 2000. 78% of online teens say they have gone online from school, up from 64% in 2000. The size of the wired teen population surges at the seventh grade mark. Going to Junior High seems to be the tipping point when many teens who were not previously online get connected. While about 60% of the 6th graders in our sample reported using the internet, by 7th grade, it jumps to 82% who are online. From there, the percent of users in the teen population for each grade climbs steadily before topping out at 94% for eleventh and twelfth graders. Much of the lag amongst sixth graders appears to come from boys. Fewer than half (44%) of 6th grade boys report going online, compared to 79% of sixth grade girls. Older girls are power communicators and information seekers. Older teenage girls (aged 15-17) have driven the growth in many of the communication and information-seeking categories since our last survey. Older teenage girls have a much higher level of engagement with a wide array of these activities than do either boys of the same age or younger boys and girls (aged 12-14). They are more likely to use email, text messaging, search for information about prospective schools, seek health and religious information, and visit entertainment-related websites. Digital communication can lead to breaches of personal privacy. About one in five (21%) online teens say they have sent an email, instant or text message to someone that they meant to be private but which was forwarded on to others by the recipient. Teens who use the internet frequently are more likely to report this type of breach. 25% of teens who go online daily have experienced this, compared with 16% of those who go online several times per week and 14% of those who go online less often.